Having a life insurance policy is not a luxury but a necessity. It ensures that the financial future of your family is secured no matter what happens. With so many schemes and policies on offer these days, it is in your best interest to take advantage of them and avail the benefits they provide. Out of the many policies on offer today, there are some that are quite straightforward – and simply provide a monetary cover to your dependants in case of your death – while there are others that go a step forward and make life insurance not just about securing their future, but also provide an opportunity for securing return on investment. This is in reference to Unit Linked Insurance Plans or ULIPs as they are commonly known; this kind of insurance policy fuses the concept of life insurance with that of investment in capital markets. What do you stand to gain by choosing ULIPs? Some people are simply looking at providing a risk cover to their loved ones in case of their demise. For others, this might not be enough and they may be on the look-out for a scheme that gives them an opportunity to invest in capital markets as well. It is for such customers that ULIPs are ideal – in case of death, the dependants will receive the insurance cover, but in the meanwhile, the money you pay to the insurer isn’t just sitting idle. It is being invested in the market by professionals(fund managers), so you get to enjoy the gains of the investments they make on your behalf. Just like a regular insurance policy, you pay a yearly premium for a ULIP. But unlike traditional policies, only a part of the premium is used to provide insurance cover for the policy holder; the remaining amount is invested in the funds as selected by the policy holder. In case of your untimely demise, your dependants will be provided with the insurance cover and / or the fund value, whichever is higher., depending on the ULIP type. Much like in the case of mutual funds, the insurance provider will grant you “units” based on the proportion of your money that is invested into the market. This unit becomes a representation of your investment and is allotted a net asset value (NAV) which is calculated and declared on a daily basis. The NAV of your unit may vary with changing market conditions and the quality of investments made by your insurance provider; therefore, it is the key factor you must keep track of when assessing the health and quality of your investments. To understand ULIPs better, let us look at an example. Suppose a person ‘A’ invests in a ULIP with an annual premium of INR 50,000 for 20 years. Now if A was to die in the initial years of the policy, the insurer would shell out the INR 5,00,000 amount that is the sum assured. However, over time, the Fund value will increase. At some point, the fund value will most likely exceed the Sum Assured amount. If the insured dies after this point, his/her nominees will receive the Fund Value rather than the Sum Assured. Who should ideally invest in ULIPs? If you’re looking to enter the capital markets and intend to stay in for a minimum of 15 years, ULIPs can be the ideal choice of insurance policy for you. Although you can partially withdraw from the policy after 5 years, after which no surrender charges will apply. To avail maximum possible gains, a medium to long term commitment is thus required from your end. ULIPs come with dedicated Fund Managers and are thus ideal for investors who want to invest in the market, but cannot find the time to manage or monitor their investments. ULIPs provide a wide variety of investment portfolios based on your risk appetite so you have control over where your money goes. Moreover, ULIPs also allow you to switch between different portfolios, whenever you feel the need to do so. This is another aspect where Fund Managers can be instrumental. With ULIPs, you can be assured that your money isn’t just gathering dust but is being actively used to boost your wealth. At the same time, ULIPs provide benefits in case of a tragedy; they thus cover the two most important aspects of wealth management – savings and investment. 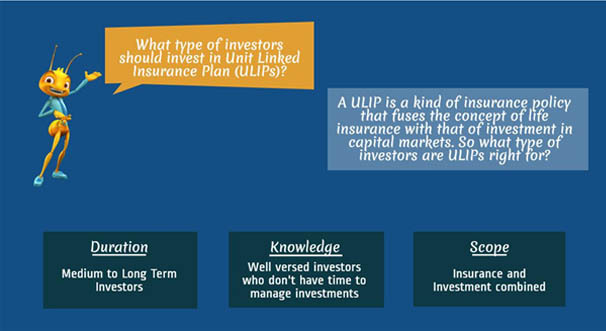 ULIPs provide the best of both worlds and are one of the most dynamic and exciting insurance schemes available today. If you find the idea of ULIPs appealing, go for one today.